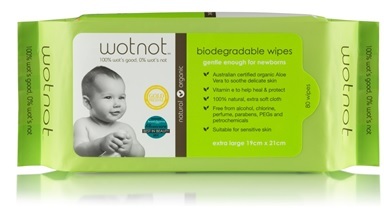 Wotnot baby wipes remain one of our best sellers year over year for good reason: they’re 100% biodegradable and compostable (in other words, brilliant from an environmental perspective! ), suitable for the most sensitive skin and Wotnot are completely transparent about their ingredients – the wipes are free from chlorine and other artificial additives, containing only certified organic aloe vera along with pure and mild ingredients to soothe and protect your little one’s skin. Wotnot is very confident you will love their baby wipes – so much so that they’re offering free trials at the website Swap 4 Good. If you’ve been wanting to try a more environmentally-friendly and natural wipe, now is the perfect time to do so at no cost!